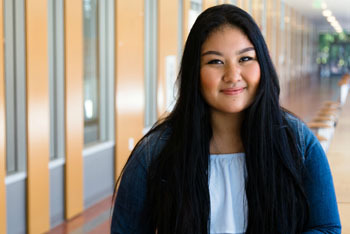 Regine De Guzman (Stevenson ’19, computer engineering) was only 12 when she launched herself headfirst into the world of coding—the fine art of writing programming language for computers. Living in a working-class Southern California neighborhood with immigrant parents, she had no high-tech mentors to help her out, just loads of self-determination, curiosity, and creativity. Since then, De Guzman, a self-taught coding whiz, has become a champion and a mentor for girls considering high-tech careers. This month, De Guzman will have a prestigious venue to share her words of wisdom about closing the Silicon Valley gender gap. She will appear at the upcoming TEDxLosGatosHighSchool, which will be held from 1 to 5 p.m. on April 15 at Los Gatos High School. Advance tickets are available through the website. In her presentation, De Guzman will make a strong appeal to parents who would like to help their girls achieve high-tech success. "Parents send their girls to coding camps or buy them programming books to support their pursuits, but to sustain their interest, parents need to teach their daughters how to code," De Guzman said. "It may be challenging, especially if the parent does not know how to code, but the learning experience will be much more meaningful. Like teaching your kids how to ride a bike or tie their shoes, parents need to be there for every technical hurdle and success they come across." De Guzman is seizing upon a timely issue in her upcoming talk. The Atlantic Monthly recently ran a hair-raising cover story entitled “Why is Silicon Valley So Awful to Women?,” describing pervasive and “pernicious” sexism in the workplace. Strong mentors are important in the face of such lopsided demographics, said Katherine Isbister, UC Santa Cruz professor of computational media. De Guzman has seen the skewed gender demographics firsthand. When applying for job interviews in tech, she would often notice “five guys and just me” sitting around in the waiting area. “"It's intimidating to see the gender inequality right before an interview,” she said. “About 18 percent of women are majoring in computer science—even less in computer engineering. Even in my classes, it is clear that this statistic holds true." De Guzman teaches software and hardware development at West Valley Branch Library in San Jose. She and her young charges are hard at work on an interactive emergency bracelet for girls; though it looks like a fashion accessory, it can call out for help in dangerous situations. De Guzman said she would have felt a lot more secure during her own childhood in Long Beach if she'd had one of these bracelets. “I did not grow up in the most privileged circumstances,” she said. Sometimes, walking through a sketchy neighborhood at night, she wondered if she was going to make it home safely. Her father, a commercial fisherman, and her mother, a food service manager, both come from the Philippines. They graduated from high school but could not scrape up enough money to attend college. Though money was tight, they worked hard to ensure a better future for their three children. At first De Guzman wanted to be a doctor. “I wanted to go university to study biology,” she said. “I enjoyed helping people and I loved science and problem solving.” But when De Guzman was still in kindergarten, her mother pooled together enough money to buy her a Compaq desktop computer from Walmart. De Guzman dove right in. Soon she was helping her parents send messages back and forth to relatives overseas. By age 12, she was designing sophisticated websites and interest pages, focusing on the marine sciences and ocean photography. “It was just something to do after school, and my first experience of learning how to code,” she said. “I didn’t realize, at first, that I was using HTML and CSS.” Both are computer languages that are commonly used in front-end web development.